Most of our great amps are available in kit form at substantial savings due to the extensive amount of time involved in the point-to-point hand wiring. The cabinets come completely finished and the professional looking faceplates and logo assure your amp will look as good as it sounds. Most kits have step by step instructions to guide you through the assembly and wiring of top quality components. You are assured of having everything you need and a proven circuit that sounds fantastic. These kits are definitely not for everyone! Don't buy a kit just to save a few bucks, but rather because you enjoy this type of work, know how to solder well, pay attention to instructions and details, and typically finish large projects that you start. You MUST have ALL of the tools shown at the bottom of this page! 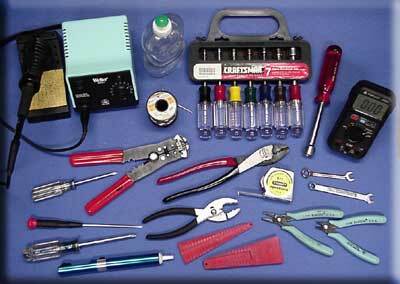 These are advanced kits, so you should have some basic kit building skills, and most important, soldering skills! Typical kits can take from 15 to 25 hours to complete. If you follow the instructions, you are never exposed to live circuits or dangerous voltages. E-mail support is provided (sorry but I just don't have time for phone tech support on KITS) and if you really get stuck and can't get your kit working properly, send me your completed chassis for troubleshooting or repair. The first hour is "on the house" (PROVIDED YOU HAVE FOLLOWED THE INSTRUCTIONS AND MADE NO MODIFICATIONS) and I can often fix the problem during this time. Additional repair or rework time is billed at $60/hr and you are responsible for return freight/insurance. All parts are guaranteed except shorted transformer windings, torn speaker cones, or similar abuses incurred after you receive the kit. Speakers and tubes are guaranteed for 30 days. These are wonderful amp kits and it is quite a thrill to fire one up for the first time and know that you built it yourself! This is a great way to learn about tube amp construction. These kits are recommended for those who have successfully completed similar tube amp projects. Click here to visit a customer's V-18/Sweet Spot kit build page, which has "in-progress" images and some assembly tips.